Watch Fight Club, then think about stuff again. What kinda stuff are we talkin' about here? Stuffy stuff? The kind of stuffy stuff that smells... stuffy? but the unusual work my teachers pass that have effect on the grades i do, cuz they are worth doing. Then I watched Fight Club, and decided to make soap. I was refining some bacon grease and it exploded, covering my kitchen and catching fire. You know, when your kitchen in on fire and you are internally debating how long to stay and fight and when to abandon all your stuff and escape with your life, you realize that you do, in fact, care. The grease wasn't hot enough to sustain fire, and it went out soon after I turned off the gas. Big mess, no real damage. The soap turned out great. People are worth the effort. Stuff that helps you be the person you were meant to be is worth the effort (whether that's physical stuff or education or whatever). Stuff that serves to make you look better to other people is not worth the effort. But all of that is fairly easy to say, but then you get into a situation where there is stuff that is clearly worth the effort, but you have to do a lot of tangential, mundane other things to get to it. Like say you want to do research in some field so that you can do what you were born to do or help other people or whatever. You're likely to need an advanced degree, and that path is thick with utterly irrelevant crap that you have to work through. 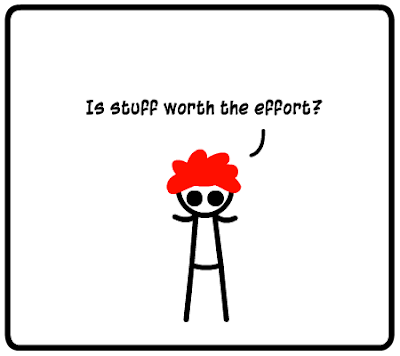 So that stuff is not intrinsically worth the effort, but the degree at the end is (at least much more) directly related to something that is worth the effort. Stuff is never worth it...slacking is the answer! let me show you my line of thought. Whenever i do stuff, im doing just that stuff. But when im doing nothing i could be doing anything, like inventing a dinosaur-laser-zombie-army. So, do nothing and then conquer the world! I ask myself that nightly.